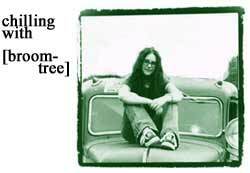 Since the rise and fall of Dakota Motor Co., Broomtree has been the only band that has come close to the great sound and message the band had in their early years. But with their new album, Transparent, Broomtree has made more of a name for themselves, taking on a slightly different sound and maturing more as a band. Recently we got a chance to ask lead singer, Kylie Schilg some questions during their tour with Petra. This interview took place on: 4/30/99. Jesus freak Hideout: What made you pick the name, "Broomtree?" Kylie Schlig: There was a time in my life (Kylie) that I felt like life was too much and I didn't wan't to go on. This is how Elijah felt as he sat under the broomtree in the desert, fleeing from queen Jezebel. He prayed that God would take his life and fell alseep. God then sent and angel with food and water and gave Elijah the strength needed to continue. I see a lot of people out there that have reached a low place in there life. Either they don't know Jesus Christ, or They are a christian that feels like they are just forgotten and that they have to suffer. Through experience I know and can say that I am here today because God does give strength to those who have open and willing hearts. As soon as I realized that I was helpless as a human in and of myself, and that I needed God, He came in and strengthened my weaknesses. Helped me stand. We wanted our name to mean something and it means exactly that. Kylie: We began playing praise and worship music at our churches... we all met through either school or church or friends. Kylie: The bands that first got me into christian music were bands like Plankeye, Poor Old Lu, Seven Day Jesus, early Dakoda Mo. Co., Sixpence None the Richer and Soulfood76. They were bands that had something other than just good music.. they had a message worth listening too. Now I listen to so many different kinds of music and so many different kinds of groups that I couldn't begin to name all of the influences that have worked their way into my writing. JFH: On your new album, Transparent, Marc Byrd and Drew Powell of Common Children contribute quite a bit with producing, writing, and adding additional instruments to the songs. How did you acquire this relationship with them? Kylie: Marc was introduced to us by Mark Q. of Rustproof Records. He used to be at Tattoo Records which Common Children was on. He just thought it would be a good match and it was. Marc then introduced us to Drew. Writing with Marc and working with him definetly helped push our band a little further and were happy with the outcome. JFH: What is your favorite Broomtree song?" Kylie: My favorite BT song would be "Beautiful" I love this song because it talks about the ugliness I create in life when I go my own way and the beauty that God creates when I go His way. It's a truth that I have experienced so many times. Relying on God for my strength and putting all my faith in Him is a beautiful thing. JFH: What is the inspiration for most of your songs? Kylie: I would say Jesus and my relationship with Him. It's a simple answer but everything that I have experienced in life always came out ok when I had Jesus. So Jesus is the answer and in every song it is made clear. JFH: What is your favorite Bible verse? Kylie: My favorite Verse is James 1:2-4. I like this verse because it talks of how we can become stronger people.. that the troubles we face can make us a better light in the future. Kylie: Hmmmm right now I would say hmmmm....ummm... I am tour, haven't seen any lately! =) Sorry. JFH: Do you prefer Mountain Dew or Surge? Kylie: I normally drink Diet soda's... but not Diet Dew... ack! I like the regular Mountain Dew... gotta drink it some nights! JFH: What does the future hold in store for the Broomtree crew? Kylie: We don't know what is to come... all we know is that God has given us a purpose and is always providing for us. So we trust that wherever He leads will be the right way and we will be willing to follow. JFH: What's your favorite thing to do to keep busy while on tour? Kylie: The old Nintendo game system in the van! Kung Fu and Mario bro's! yea! Kylie: Yea, we have a 24 hr. christian rock station called radio U here in Columbus. You can listen on the web at www.radiou.com. The bands I mentioned in our influences are some of them.